I've done this for the last 2 years (2007, 2008) -- so I figured I may as well do it this year! If you decided to play along on your blog, leave a comment so I can read your 2009 recap. Cooked in Betty Crocker's kitchen, during my very first blogger trip! I did not keep the resolutions made last year - I think life and survival got in the way. I will make more this year, and hope that I can be better about following through! For the first year in a long time, nobody close to me gave birth. Nobody close to me died in 2009. No specific dates jump out at me - but looking back I realize there was a lot of travel. As a family, we visited Vegas in February, Bo traveled to Boston after he accepted a job there and he took a trip by himself to Milwaukee for a friend's birthday, I traveled to Minneapolis for my blog, Vegas again with my sister, Milwaukee with my sister and daughter. It was Bo's hard work and skills and not mine, but the biggest achievement of the year was closing in the back patio so we could give Lydia her own room. Roku box. Hands down the best $100 we spent this year! I love Netflix Instant view, but not as much as the kids do! My husband -- who has worked so very hard again this year for his family. My kids -- who are all growing into wonderful people. My trip to General Mills. Spending my mom's birthday with her. Vacationing in Vegas with my family and then again with my sister. Not having to buy diapers anymore? My aunt and cousin visiting. spent more time with friends - I see more Starbucks dates in 2010! Quietly, at home, with my husband, kids & my sister. Unfortunately, everyone was sick this year -- but we still had a nice day. I read many books, but none stand out as the best. Back patio closed in. Lydia out of our room into her own. A new bed. Tuya's Marriage -- it's from 2007, but I watched it this past year and was moved by it. I worked on my 42nd birthday. Colin was appalled, but I didn't mind. 32. How would you describe your personal fashion concept in 2009? Frumpy. Gotta change that next year! My sweet children and my husband's sense of humor. Friends. Text messages. I've never been one for celebrity crushes. 38. Tell us a valuable life lesson you learned in 2009 . I've been spending time this week cleaning up online accounts so that I can start 2010 with a fresh (or fresher) plate. I had gotten lax about filtering my gmail account, and I had tons of advertising / spammish emails clogging up my inbox. I've been working diligently at creating new rules so I can easily delete unwanted emails, while filtering others I don't want to lose. To do that, I create filters for incoming messages. For all the advertising / newsletter / miscellaneous emails that come in, I route them all to a "ads" label. If any are of particular interest, I can remove that label -- but otherwise once a month or so I pull up everything labeled "ads" and hit the delete button. It quickly cleans up my inbox, which makes me happy. Once I added about a hundred new emails to various filters, I went through and deleted almost 2000 emails. Having them filtered into categories makes the deletions easy. I also went through my feed readers and deleted all the feeds I rarely read, or are filled with drama, or are genuine train wrecks. I use 2 different feed readers -- bloglines and google reader -- to separate personal and work-related feeds. It felt especially good to delete the train wrecks (you know you read a few! But I decided to cut down on the drama that really has nothing to do with me next year.) I deleted almost a hundred feeds from my 2 readers. And, finally, I did a minimal purge on Facebook. The new privacy settings have made it possible to hide your Wall from others, and I decided that if people were hiding their Wall from me, there was no reason for us to remain friends on Facebook! At first, I was a bit pissy about it and hid my Wall from them -- and then decided to be a grown-up and handle it like an adult. See above: cutting down the drama in 2010. I set up some files for 2010. It's too soon to close out most of my 2009 files, as there are things that won't be completed / resolved until mid to late January, but having the 2010 files created has allowed me to start filling things in for the new year. I track blog tours, and freelance work, and the like in various Excel spreadsheets. What about you? Are you cleaning up your online world to get ready for 2010? FedEx knocked on my door early this morning with a box holding 2 bags of Nature's Peak Frozen Fruit. I received a bag of mixed berries and a bag of mango pieces. The first thing I noticed was that each bag had a resealable zipper on the top! This is a great feature since I rarely use an entire bag of frozen fruit at one time. 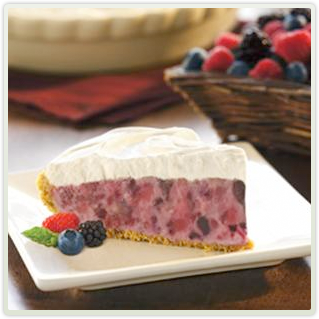 When I looked at the back of the mixed berry bag, I saw the delicious-looking pie pictured to the left. The recipe was so simple, and I had all the ingredients in the house, so I mixed one up for dessert. It tasted as delicious as it looked - and the fruit smelled wonderfully fresh. I'm looking forward to mango smoothies later this week with my other bag of fruit. I might also try a mango salsa recipe. I love mangoes, but don't buy them often because it can be such a pain to peel and cut them. This frozen product takes care of all that for me. Nature's Peak frozen fruit has 11 different varieties of fruits in 16oz bags, and all are frozen at the peak of freshness. You can learn more about their products, as well as find some great recipes, at their website -- Nature's Peak Frozen Foods. I have 2 coupons for a free bag of frozen fruit for one of my readers living in one of the above areas! Please leave a comment letting me know which fruit you would choose if you receive the coupon and I'll use random.org to choose a winner on Friday, January 1, 2010. Disclosure: I wrote this review while participating in a blog tour campaign by Mom Central on behalf of Nature’s Peak and received a sample to facilitate my candid review as well as two coupons to giveaway. In addition, Mom Central sent me a gift card to thank me for taking the time to participate. If you've been reading along, you know that the last couple months in my house haven't been the healthiest! I did have one new gadget that made life a bit simpler for us, though. A few months ago, I received a Temple Touch Thermometer to try out from Mom Select and Temple Touch Thermometer. This thermometer is WONDERFUL! I have used traditional thermometers and digital thermometers in the past, but getting a child to keep it under their tongue, or in their armpit was always a bit of a challenge - especially when someone was already feeling under the weather. I'm pretty good at determining if someone has a fever by touch, but doctors' offices usually want to know a number instead of my guess. The Temple Touch Thermometer is easy to use and gives you a result in less than 10 seconds. It has a memory feature to recall recent temperatures taken, as well as a timer to help you remember when to give the next dose of medicine. I really liked that I could take the kids' temperatures while they were sleeping, by simply putting the thermometer against their temple and waiting a few seconds for the reading. This would make a great baby shower gift!You can find the Temple Touch Thermometers at Walgreens, with a MSRP of $29.99. Visit their website for more information! Or, you can follow the inventor on Twitter @TempleTouchMom. Disclosure: I received a Temple Touch Thermometer from Mom Select and the manufacturer to help facilitate my honest and complete review. No additional compensation was provided. I received 3 bottles of a new salsa being offered by Rosarita, thanks to Mom Central & Rosarita! These new bottles of salsa are available in only a few markets right now (Phoenix, Los Angeles, Dallas and Denver), so I felt lucky to have the chance to try them out! The Rosarita brand was actually started by a man in Phoenix in the 1940's, and the Mexican woman gracing the label was drawn by one of his relatives. 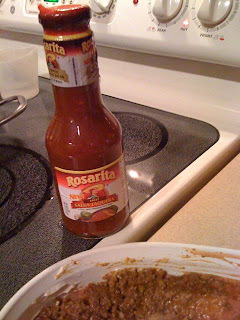 Since then, Rosarita has offered authentic Mexican-style refried beans and are currently the top selling brand in the United States. Their new salsa line, includes three authentic flavors that range from mild to hot- Mild Salsa Mexicana, Medium Salsa Verde and Hot Salsa Taquera. 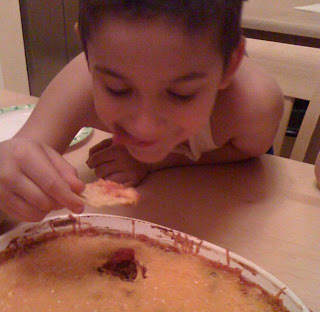 Last night, I wanted a quick, easy, kid-friendly meal so I decided to make taco dip, using a bottle of the Rosarita salsa. Layer the ingredients in a baking dish (I use a 9x11 pan) in the order listed above. Pop into a 350 degree oven for about 30 minutes, then serve with chips! It's delicious and the Rosarita salsa was a wonderful addition to the recipe. The hot salsa we received was VERY spicy, but if you like spicy, it's great! Disclosure: I wrote this review while participating in a blog campaign by Mom Central on behalf of Rosarita and received a sample to facilitate my candid review. Mom Central sent me a gift card to thank me for taking the time to participate. A year ago, I rarely texted. I would sometimes with my brother, and sometimes with Bo, but it wasn't an everyday thing. Now, I text daily -- not the thousands of texts that you read that teens send, but I send more than 100 a month and had to recently upgrade my phone plan. I can tell you that I do NOT text while driving, ever. I do know people who do text while driving, though, and it is a very dangerous practice. Allstate has launched a cause to encourage teens not to text while driving. For every person that joins the Allstate Thumbs Up cause before January 15, 2010, Allstate will donate $1 to Teen Safety Driving programs, up to $25,000. As of tonight, about 12,500 have joined -- so we have just over 2 weeks to find another 12,500 to join the cause and pledge to keep their thumbs off their cell phones while driving. It takes your eyes off the road on average of five seconds at a time. At 55 mph, that's like driving the length of a football field - completely blind. It's like driving after having 4 beers. It makes us 23 times more likely to crash. It results in car crashes that kill an average of 11 teens each day. It's results in 330,000 distracted driving injuries every year. While I don't have any teens in the house (yet), I do have friends with teens. The parents I know all have a rule that cell phones are not to be used while driving -- but teens will be teens and I know that the rules are sometimes broken. One friend monitored activity with their online statements, which led to her teen losing phone privileges for a month. While her teen may have felt the punishment was harsh, the lesson was learned and when phone privileges were re-instated, there was no more texting or calling while driving. I have added this cause to my Facebook account, and have asked my friends to join! I am asking all my readers to join as well in order to encourage teens (and adults!) to keep their thumbs on the steering wheel and not their cell phones while driving! While I love the convenience of texting, I'm not about to put myself or others in danger by texting and driving -- and I hope that others agree! I wrote this review while participating in a blog tour campaign by Mom Central on behalf of The Allstate Foundation. Mom Central sent me a gift card to thank me for taking the time to participate. The kids were delighted with their Christmas haul, and we had our usual long stretch of gift opening so they had the chance to look at and play with new things before something else was opened. We didn't make Christmas Eve mass, so we attended 10AM services. My sister came over and we opened more gifts, and then decided to postpone our usual fancy Christmas dinner since everyone was under the weather. Bo loves fudge, and I've had mixed results trying to make it in the past. I found a new recipe recently and was able to throw it together in about 5 minutes on Christmas Day. It's not a traditional cooked sugar fudge, but it is EASY and TASTY. There are only 3 ingredients -- 3 cups chocolate chips (I used semi-sweet), 1 can sweetened condensed milk, 1/4 cup butter. I melted the ingredients together in a large Pyrex bowl in the microwave, ran the microwave 1 minute at a time and stirred to mix it all together and when the chocolate had a good sheen I mixed in a 1/2 cup of chopped walnuts and poured it into a buttered 8x8 pan. It set up in the refrigerator, and tasted yummy! It would be easy to add in other mix-ins -- we were thinking of peanut butter, or marshmallows, next time. Really it took me 5 minutes from start to finish! If you want an easy fudge recipe, I highly recommend this one! I'm grateful I planned ahead again this year and got most of my shopping done early. I ordered my cards early -- even though they didn't go out until last Friday. I shipped the few gifts that needed to be sent on time. All that's left before Friday morning is baking Christmas cookies and wrapping gifts for the family. Which is good, because I'm down with a rotten winter cold. Bo has been sick with a rotten cold for over a week now (but is improving). Nate is recovering from pneumonia and ear infections. Colin has a cold / asthma act-up. And, Lydia has a few sniffles but I'm hoping that's as far as it goes with her. But, since I planned ahead -- and managed to stay well until I finished my last class of the year on Tuesday, it's easier to roll with the illnesses. I picked up some gift bags to make the wrapping easier, and if I don't get all the cookies I wanted baked before Christmas, there's always next week. My mom ordered groceries for us as part of our Christmas presents and had them delivered, which included our Christmas dinner, so I don't have to worry about that! And, I'm so very lucky that Bo steps up to cook meals and take care of all of us. It feels more laid-back this year, which I like. We didn't decorate outside as much as previous years -- but Bo was sick and it has rained a lot. We do have some lights up which are pretty, and it'll be easier to put it all away in a few weeks. Our tree went up a couple weeks ago, but wasn't decorated until earlier this week. I'm hoping everyone is healthy enough to make it to Christmas Eve Mass tomorrow, but other than that there's nothing on our schedule. Christmas Day will find us at home, opening gifts and playing. My sister will come over in the afternoon and we'll enjoy a simple dinner. If the weather cooperates and everyone is feeling up to it, maybe we'll head out for a walk at a nearby park. Next week, I'd like to see some closet cleaning before we end 2009, but I'm not going to make a big deal out of it. I also hope to geocache some, and maybe hide one of our own finally. Even if Mom Central hadn't chosen me to be part of the blog tour for the SOAR! Scholarship, I still would have written about it. The SOAR! Scholarship will provide 3 women with a wonderful start in their own photography business -- including professional equipment, mentoring, instruction and encouragement throughout 2010. Each month will bring new information, new challenges, and new chances to build their businesses into successes. Nationally renowned photographer, Me Ra Koh, created this scholarship to empower and enlighten women. This month, women across the country can submit a 2-minute application video for one of three SOAR! scholarships to be awarded on January 1, 2010. You can watch other submissions, then create your own application to submit at the SOAR! website. Imagine if the professional equipment you needed was dropped in your lap so you could pursue your dreams? If you had industry leaders ready and willing to help? If every month, you had the encouragement from those who were already successful and wanted to make sure you succeeded? While there will be hard work ahead of them, the women who win this scholarship will receive a significant advantage over others trying to start new businesses next year. I am eager to watch the scholarship recipients build and grow their businesses in 2010. Will one of them be you? The only way to find out is to apply! Hurry, though, as the deadline is fast approaching! Don't put it off! Disclosure: I wrote this review while participating in a blog tour campaign by Mom Central on behalf of the SOAR! Scholarship and Me Ra Koh Photography. In addition, I received an Amazon gift certificate to thank me for taking the time to participate. Before Thanksgiving, I had the opportunity to visit a Whole Foods Store in Tempe AZ and was able to spend some time with one of their chefs. She suggested some new recipes (although we all decided we did NOT like beets, we did like her take on mashed potatoes!) and was very helpful. One thing that really struck me during our visit was how friendly and helpful ALL of the staff was. As we moved through the store, I noticed various associates offering help to customers. Everyone I saw seemed to genuinely like their job, and was eager to provide help, advice or information. Associates were ready to provide samples, and genuinely wanted to make sure customers were purchasing something they would enjoy. When we asked for a recommendation for wine, Dave asked us our price range, then pulled out a bottle that was in our price range that he felt would be perfect. We were able to try a sample, and had to agree that it was delicious! 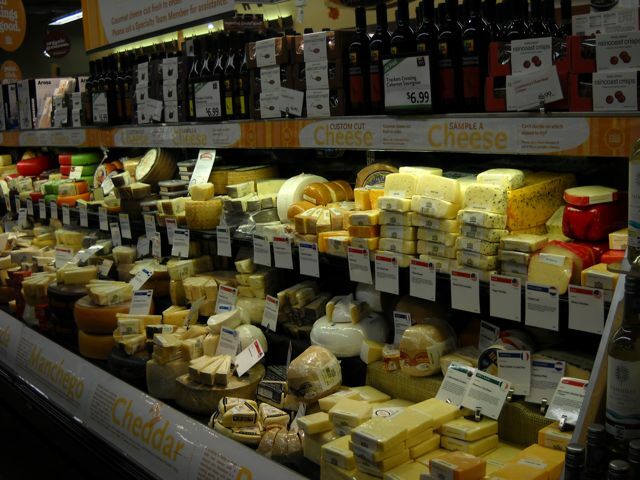 I also appreciated the chance to try the pricey cheese before we purchased it. The Whole Foods website is also full of helpful information and recipes. There are thousands of delicious-looking recipes to try, and you can sign up for a Recipes newsletter to always get the latest recipe. I also like that they split up the recipes into different categories like "Cooking with Kids", "Gifts" and "Quick and Easy." They even have almost one thousand gluten-free recipes listed! One thing that Bethany did mention was that people sometimes refer to Whole Foods as "Whole Paycheck" While there are plenty of items that could eat up a food budget (plenty of yummy, delicious items I'd like to add!) there are also plenty of competitively priced items. 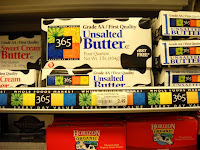 Choosing from the Whole Foods 365 brand for things like butter, canned goods, and other staples won't cost you any more than traditional grocery stores. 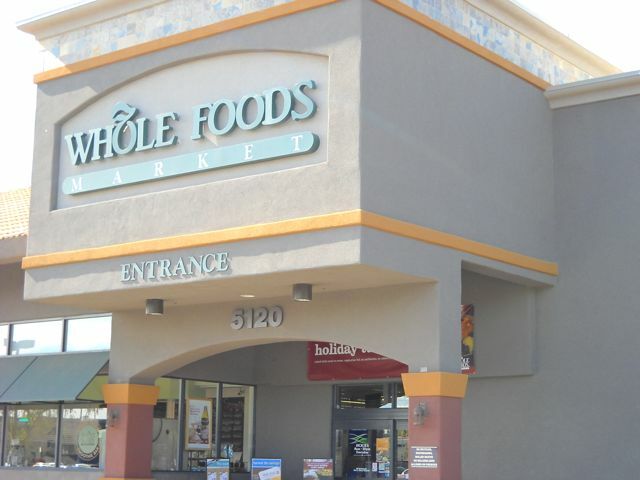 Whole Foods would like to give one of my readers a $10 gift certificate to spend at one of their stores. If you have one near you and want to pick up some goodies for the holiday season, check out their website and leave a comment with a recipe that you would like to try. Disclosure: I want to thank Whole Foods for providing a gift certificate for this giveaway! It's been a whirlwind of a week. Bo came down with a nasty cold that had him in bed for a day and he's still feeling under the weather. I had a class earlier this week that was for a program I hadn't really worked in (other than preparing for the class) that caused me a bit of stress. Thankfully, certain features of software programs haven't changed in 15 years and the years of training I've done prepared me for figuring some things out on the fly. I had a mantra going of "If only I can get through Tuesday morning" for a few days prior -- and thankfully I DID get through it just fine! Tuesday afternoon I met with the speech pathologist and we are FINALLY starting services for Nate in January. I am happy with the speech pathologist -- she is kind, knowledgeable, interested in Nate and seems very competent. I am not happy that it took us since September to get to this point, but realize that is bureaucracy. I am eager to get his appointments under way finally! We did have a meeting with a district representative who tried to imply that it would be better if Nate was enrolled, but in the end she agreed that he would be able to receive help at our local school without enrollment. I found it interesting that if he WAS enrolled, there would be very limited times during the day when he could receive services. They can't pull them out of core classes, or electives, or recess . . . and so I'm not sure what that leaves? We also visited Santa. Yes, I know I started Nate on 2 different antibiotics. But, he had a tough day, we had planned on the visit, and he felt up to it. 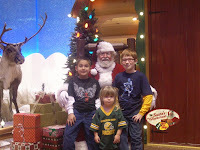 Kudos to Bass Pro Shop for offering free pictures with Santa, and making it so that nobody has to wait in long lines. Today our dog went to a new family. Unfortunately, while she was a good dog, she never stopped nipping and jumping at the kids. She is a heeler, and while we understood she was trying to herd the kids, it wasn't safe for Lydia. She would knock her down and snapped at her so that we could never let them be near each other. I had been looking for a new home for her for a while, and am glad we found her a place to live with lots of room to run, other dogs, no kids, and a new owner who was interested in having her join her family. The boys were sad to see her leave, but they also understood that our family wasn't the best fit for her either. And, so I slide into Friday. It's a week before Christmas and I need to address and mail our cards, wrap gifts, trim the tree, bake goodies . . . and enjoy the holiday. Hopefully tomorrow won't find me with Colin at the doctor's office! I loved this book! It was written in a fun, lighthearted manner but it was also chock full of easy, delicious and filling recipes! The book came about because the author wanted to provide a resource for families out there who need a quick, easy, satisfying meal to potluck events. She includes information about meals that are great for athletes both pre- and post- game. She also provides tips on how to choose meals to entice even picky eaters. While there is a wealth of information in this book, the recipes make it shine. She has included a little bit of everything -- from appetizers to breakfast foods to entrees to side dishes to soups to desserts. And, even though she included a little bit of everything -- she never skimped on recipes! There are tons! While there aren't any color photographs of the dishes, there are tons of wonderful illustrations that made reading fun. It's hard for me to choose a favorite recipe, but I think I'm going to make her oatmeal casserole for our Christmas breakfast this year. It's full of fruits and oatmeal, and takes about an hour to bake. The perfect amount of time for the kids to open their stockings and gifts! The book is published by Five Star Publications, and more information can be found at www.PotLuckSurvivalGuide.com. 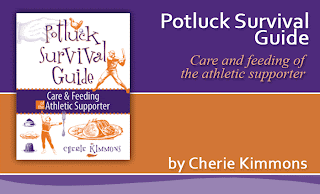 You can also purchase Potluck Survival Guide: Care and Feeding of the Athletic Supporter from Amazon. My sweet Lydia has passed the 2 1/2 year mark and is closer to 3yo than 2yo. I've mentioned her spunky personality in the past, and she continues to be spunky and full of personality. She has a vivid imagination and has an imaginary baby. When asked, she will tell you the baby is named "Two." She will help the baby up the steps, make sure you wait while the baby catches up, and makes sure the baby is strapped in the car. Last night, while my sister was watching her, she had a long conversation on my sister's phone with the Baby's Daddy during which he had to get a flu shot and a Band-aid. Speaking of phones, she loves my iPhone. I've downloaded a number of toddler games and she will entertain herself in line and out shopping with the games. She knows how to operate the phone, what icons to choose to find the videos, and picks which games she prefers. I like my iPhone, but I think she uses it more than I do. She loves "her boys" and wants them around her as often as they drive her crazy and she orders them to leave her alone. She's bossy and opinionated and holds her own in sword and gun battles with her brothers. We often call her our "warrior princess." She is wonderfully helpful and will assist at any chore. She's the first one to help empty the dryer, or put away the silverware, or carry bags in from the car. She's cheerful about helping and rarely gives up -- unless the bag is too heavy. She's also fiercely independent, which can be scary when we're out. She hasn't had a need for strollers since she learned to walk, and has to be cajoled into shopping carts. She is good about holding hands -- sometimes. She will walk off without a backward glance and just assume we'll be there when she's ready to acknowledge our presence again, which means we need to keep an extra-vigilant eye on her at all times. It's a joy to watch her grow, and she seems to be such a perfect fit in our family after our rough and tumble boys. Next year, she'll be able to say Christmas clearly, but this year I'm enjoying her exclamations of excitement for everything that is "Missmiss!" 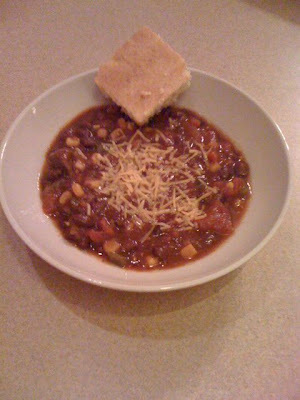 Bo made a new chili recipe last weekend, and it has become my new favorite chili. You can make it in a slow cooker, or in a big pot on the stove. If you want to taste yumminess, here's the recipe! Heat 1T oil in soup pot or dutch oven over med-high heat. Brown half the meat and transfer to slow cooker. Brown remaining meat in additional 1T oil and transfer to slow cooker. Deglaze pot with tequila, scraping all the bits into the liquid and then pour in slow cooker. Add tomatoes, peppers, onion, and Fajita seasoning. Stir in beef broth and tomato paste. Cover and cook on high for 4 hours. Stir in beans, corn, and lime juice. Cook another 20 - 30 minutes. We top with shredded cheese and serve with cornbread. Delicious! We've been talking to the boys about their favorite parts of the holiday season, and while presents definitely rank in the top 3 . . . so does spending time together as a family. Independent from each other, both boys have expressed how much they like putting up outdoor lights with their Dad, having video game tournaments, and just spending time with each other. I admit I was a bit surprised, since I feel like we already spend a lot of time together. It's one of the reasons we decided to homeschool, and something that we truly enjoy. I realize it maybe gets lost in the day to day drudgery that is life sometimes, and that we need to focus on spending time together that has more meaning, or just more fun. Every year, we keep one gift to present at dinner. It's a tradition my mom started years ago when she found gifts in a closet right before dinner that she had forgotten about. This year, I already have the dinner gifts purchased for my family (which I can't list here because Bo reads and then he'll know! ), but I've decided to add something else for the boys. I'm working on making coupon books for each boy that will include things like "Lunch out with Mom," and "Saturday errands with Dad," and "Geocaching as a family," and "Mom will make your bed today!" I want to choose things that are a bit special, don't cost much, and are enjoyable. On one hand, I think it's a bit hokey, but on the other hand I think they'll really appreciate them. I'll let you know what they thought in January! So, I was happy to try out this new style that has 3x the fiber and calcium equal to an 8 oz glass of milk. More nutrients can't be bad, right? Well, they could be bad if they didn't taste as good as the traditional version. Based on the empty bowls last night, I think it's safe to say that it tastes just fine! None of us noticed any difference in taste (and I didn't tell them it was different until AFTER dinner.) Nate felt it was a bit tough, but I think that's because we usually eat angel hair pasta, and this was the thicker spaghetti noodles. If the price is comparable, and they come out with an angel hair version, we'll definitely add this to our pantry in the future! Visit the Ronzoni website for more information about their products and nutrition facts. Ronzoni knows how tough it can be to feed kids healthy, nutritious meals that they eat and made this funny video to commiserate with moms. Lydia especially appreciates the robot that shows up near the end. Disclosure: I wrote this review while participating in a blog tour campaign by Mom Central on behalf of Ronzoni Pasta and received a sample of Ronzoni Smart Taste Pasta to facilitate my review and a $20 thank-you gift certificate. As mentioned in my recent giveaway post for the Crayola Glow Dome, we also received a Crayola Beginnings Color Me A Song to play with and review. Not one to let her brothers hog the limelight -- here's Lydia's video review. (She handed me the video camera and said "Mom - I do review, too!" I was contacted by PictureIt Postage recently wondering if I would like to try out their product. I had never heard of them before, but I found out they offered personal photographs turned into regular USPS postage. I loved the idea, and took them up on their offer to let me try it out! You can see one of the sheets of stamps to the left. I chose a picture of my three kids that was taken at the same time as our Christmas card photo (but wasn't the photo I chose for our cards.) I think they look great on our envelopes and really love the extra personalization they offer. The process was very simple! It took me longer to choose the photograph than it did to complete my order. You choose a picture, upload it to the PictureIt Postage website, choose your stamp denomination and how many sheets you'd like. (You can choose post card, letter, and many other rates.) Then, you fill in your shipping and billing information and you're done! My stamps arrived only 2 days after I ordered them, which I thought was very fast! They look great and I am very pleased with the service. 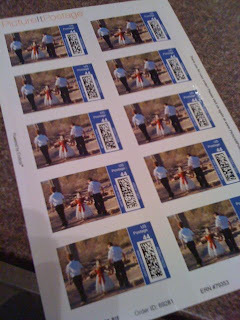 For twenty 44 cent stamps, the cost was $18.95 plus shipping. It is a bit pricey, but for special occasions, I think they are unique and different. I think they would be great for weddings, baby announcements, thank you notes and holiday cards. They'd also be a fun marketing device for companies to put their products on their postage. I was very happy with how easy it was to use the website, and how quickly the stamps arrived! Thanks, PictureIt Postage! Now it's up to me to address the envelopes! Disclosure: I received a promotional code which allowed me to order a set of personalized stamps for my own use at no charge, in order to facilitate my honest review. No additional compensation was provided. We had the opportunity to review a set of 11 historical graphic novels from Timberdoodle over the last couple weeks. When I opened the box, both boys (ages 7 & 9) were eager to check them out. Colin (9yo) immediately sat down with "The Discovery of T. Rex" and devoured the book. Nate (7yo) has been interested in Leonardo DaVinci for a long time, so that was the first one he grabbed. These graphic novels are well-drawn and full of interesting information. My boys enjoy graphic novels, but I often struggle finding ones that are appropriate. I like that these can be incorporated into our lessons, as well as provide them with reading material that interests them. Nate prefers reading non-fiction, so these are even more up his alley! Colin has been learning about early colonial times, so the book about Christopher Columbus dovetailed nicely into our lessons. While these books sit on our homeschooling shelves, I know they will be pulled down and read outside of lessons as well. The books are geared for 8 - 14 year olds (3rd - 8th grade), and Colin found that he had no trouble reading them. Nate needed some help with some of the words, but they weren't overly difficult for him to read either. Each book is 48 pages long, and I liked the fact that each book included a timeline, extra facts, glossary and an index. The glossary is a wonderful supplement for both spelling and vocabulary units. These are great addition to our other learning materials. The set of 11 we reviewed is available for the amazing price of only $16.95 -- making each book cost only $1.54! 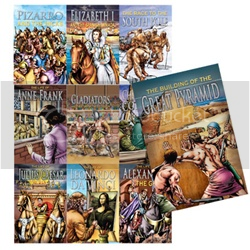 Timberdoodle offers a wide variety of graphic novels, which cover a ton of different subjects. The individual prices are comparable to any book / graphic novel, with the added bonus of being educational. Timberdoodle is one of the first homeschooling companies I purchased products from years ago when we started our homeschooling journey. I have always appreciated the wide variety of products, good prices and great customer service. Disclosure: This post is part of a blog tour arranged by Mama Buzz. I received the set of graphical novels from Timberdoodle to facilitate my honest and complete review. My sister and I always head out to shop the day after Thanksgiving, but we don't get up early. I check the ads, and we head out when we are ready -- usually around 10 or 11 AM. While I didn't get the $3 pajamas this year, we did find a few good deals that were still available. At that time of day, we usually don't have to wait in line either! One store we visited had a long line for checkout after noon, which surprised me. I was especially surprised when I noticed that many of their 50% off sales took the prices of items all the way down to more than the regular price at most other stores. Which means those people snapping up tiny Disney princesses were thinking they were getting a deal - when the regular price was $1 less at another local store. It's important to know prices if you want to ensure getting the best deal. Stores can offer the exact same product at a wide range of prices. Just yesterday, Colin chose a new ornament for our tree that was marked at $7.97. A second store we visited had the exact same ornament for $19.99. I've kept a grocery price list in the past (and keep meaning to create a new one), which helped me find the best deals on groceries and get an idea of sales cycles. In the same spirit, I rarely buy something the first time I see it so I can check prices. I check prices at a few different stores, as well as online, to try and find the best price. If you have a smart phone, you can check prices using your phone. The google phones allow you to scan an ISBN and it will show you prices at local stores, as well as online. With my iPhone, I usually check Amazon for pricing if it's something I haven't seen before. 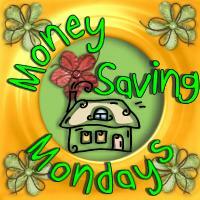 Keeping lists and tracking prices is an excellent way to make sure you get the most for your money! Here's a video of part of the boys' game from last week. They have had a great time this season, and have worked with awesome coaches. We are fortunate that we have many options for sports leagues (that aren't crazy money) with great volunteer coaches. This is the 2nd year the boys have played flag football, and I know we'll be back next year. In the video, you'll see Nate take the flag off a member of the opposing team, and do a little hop of excitement when he goes near the coach (after handing back the flag to his opponent.) Then, you'll see the kids line up -- Colin has the long sleeved orange top on under his team shirt. **Giveaway is closed** Winner (drawn with the help of random.org) was Stephanie -- comment 13. Thanks for entering, and watch for more giveaways in the future! While my favorite Crayola product is still the Crayola box of 64 crayons , I have to admit that they have some neat new products available. My kids were recently given the opportunity to test out some of the new products and had a blast with the 3 we were sent thanks to Crayola and My Blog Spark! The first thing we opened was the Crayola Beginnings Color Me A Song . This is an art board, that comes with 8 triangular crayons that store neatly in a drawer on the side. Kids place a piece of paper on the board, push a few buttons that look like musical instruments, and color. The faster they color, the faster the music plays. When they slow down, the tempo slows along with them. Lydia (32 months) had a blast playing with it and quickly caught on to the different tempos. She liked pushing the buttons and hearing the different instruments play music almost as much as she enjoyed coloring to the music. Finally, Nate tried out the Crayola Color Explosion Glow Dome . Again, this took a bit of time for set up, but Nate persevered. Kids color on a clear piece of plastic that sits in the middle of the dome, as well as the dome itself. Special markers are included with the Crayola Color Explosion Glow Dome . 2 templates are included that kids can place under the clear plastic to draw on, or kids can draw their own designs. Once the designs are drawn, lights go out and buttons are pushed! The black light in the dome makes the colors glow and the dome rotates to make the pictures appear animated. It was neat, and both boys had fun drawing designs. Nate did a video review to show you all the details! Now that you've gotten through all that, I can tell you that I have a Crayola Color Explosion Glow Dome to give away to one of my readers!! This would make a fun gift for any child between the ages of 5 and 10. To enter the giveaway, leave a comment below telling me your favorite Crayola product! Be sure to leave your email address if it's not connected to your profile so I can contact you if you're the winner! Winner will be drawn first thing Monday morning, December 7, 2009! I always use random.org to choose the winning comment. Good Luck! Disclosure: I received the Crayola products listed above from Crayola and My Blog Spark to facilitate my honest and complete review. They also provided the product to give away. No additional compensation was provided. Actually, it was Monday that was crazy and the rest of the week I've been busy playing catch-up. I had planned to spend Monday at home, schooling and cleaning, but you know plans are often set aside for life. Nate has been coughing for too long, and when he was still coughing when he woke on Monday, I made an appointment for his pediatrician. They decided to treat it as asthma, and sent me off with prescriptions for steroids and albuterol vials for our nebulizer. That took a good chunk of the morning. A couple non-bloggable things happened Monday which succeeded in making me feel even more stressed, vulnerable and worried. Just when I thought that at least the day was over, my sister called and needed me to take her to the ER. That was actually an interesting couple of hours as I people-watched while reading my Kindle and felt grateful that this visit wasn't going to cost me anything! (Thankfully, she's fine. A necessary trip, but she's okay now.) And, then a late night visit to a 24 hour pharmacy. Why can't the ER fill prescriptions? Tomorrow both boys have an early morning dentist appointment -- Nate needs a spacer and Colin needs his tooth repaired. After that, it'll be schooling and laundry! I'm tired, but was able to take a good nap this afternoon, which felt wonderful. Everything just seems easier after a good, long nap! This post may sound a bit whiny, but looking back I'm actually pleased with the outcome of the week. Nothing terrible happened, just a lot at once! We're capable of meeting the challenges placed before us, it just made for a crazy week this week! I love Christmas music! When the day after Thanksgiving rolls around, I fill our CD player with Christmas music and hit play as often as possible. I also fill up my iPod with Christmas music playlists. I love that Amazon is offering free holiday music every day in December! Each day a new song is available for download. Amazon always has lots of choices for free music downloads, but I appreciate the chance to add more holiday music to my collection for free. Amazon also has 100 albums for download for only $5 . No matter what kind of music you like, there are albums for you! What are your favorite holiday / Christmas songs? I have always loved Silent Night and Good King Wenceslas. My boys love Jingle Bells and the Chipmunks Christmas song. 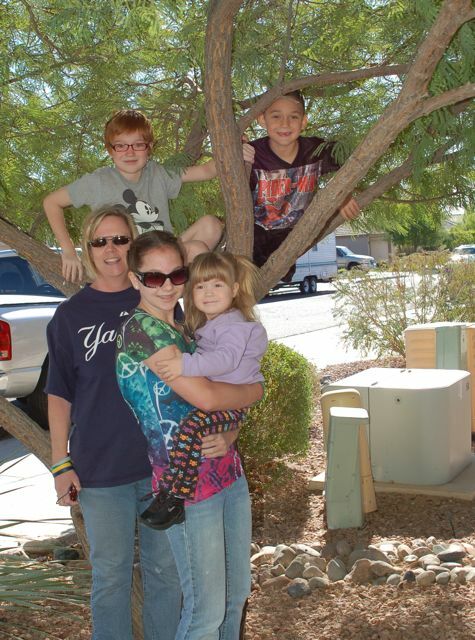 Thanksgiving has always been a simple affair in our house since we moved to Arizona. The first year we lived here, we drove to Rocky Point, Mexico, camped on the beach and ate a wonderful seafood meal at a local restaurant. It was my absolute favorite Thanksgiving ever. Yesterday, we enjoyed Thanksgiving at home. 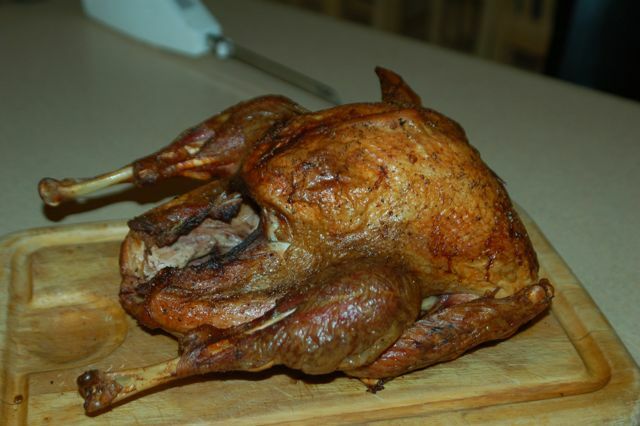 Bo brined, and then grilled a 13 lb turkey for our feast. He also roasted the fresh beets we purchased from Whole Foods last week. While the texture is definitely different than canned beets, I have to say that the flavor is the same. We won't be having them again, but I will say that the red beet definitely has a stronger flavor than the yellow beet. It's a flavor that nobody in the house appreciates. I made mashed potatoes following Bethany's recipe. They were very rich, and tasted great. I left the skins on, but will return to peeling the potatoes as most of us didn't like the texture with the peels. I cooked up the Whole Foods organic cranberry stuffing and those who like stuffing enjoyed it and said the flavor was good. It was a little wet for their taste, so in the future, I would cut the water a little bit. It was ridiculously easy to make -- bring water & butter to a boil ( I used about 1/2 the butter suggested), add stuffing mix, remove from heat, stir and let sit for 5 minutes. I made gravy from the drippings -- that nobody ate but me. I baked fresh rolls, which were soft and good -- but I think they would have been softer if I hand-mixed them instead of using the mixer. I will make them again (for a crowd next time - the recipe I chose made almost 3 dozen) but without the mixer to see if they are softer. Colin, who usually loves bread, refused to even try them. 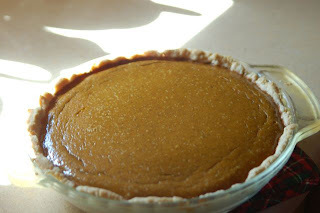 I baked a pumpkin pie -- using Whole Foods pumpkin and that was delicious. I made a crust I found in my Betty Crocker iPhone app that used flour, oil and water and did not require any rolling. I pressed the dough into the pan before pouring in the filling. 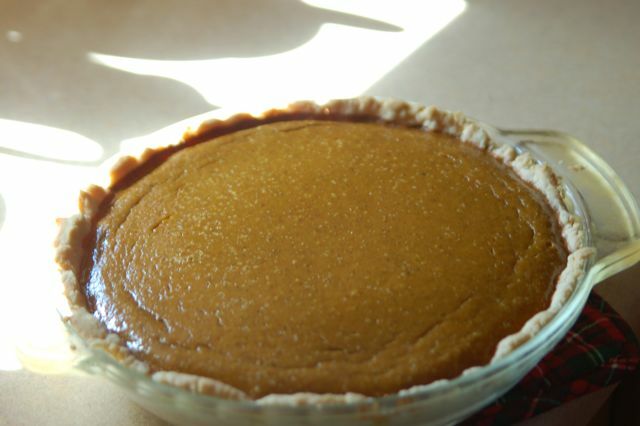 It was an okay crust -- definitely faster than my traditional crust -- and worked with the pumpkin pie filling. My traditional crust is much flakier, but I was surprised to note that this crust did have some flake. My kids love pumpkin pie and this pie was inhaled last night. Good thing I have more pumpkin and evaporated milk in the cupboard! 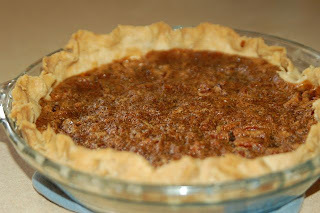 I made chocolate bourbon pecan pie -- using my traditional shortening, flour & water crust. (I figured the only way to truly compare was to have both available) The pie was delicious! My sister joined us and we had a nice dinner. Looking back, I realize that mashed potatoes and pumpkin pie are the only things that everyone enjoys. Maybe next year we'll try a totally different kind of meal and make foods that everyone likes? A meal of Thanksgiving of our favorite foods and dump tradition? I'm liking the idea -- come back next year to see if I follow through! My aunt and cousin stayed with us, and my boys were gracious enough to give up their rooms and bunk with their sister during their stay. It was wonderful having them here as it's been far too long since I've seen them last (12 years!) They live on the other side of the country, though, and travel with families is always difficult. As much as we love living in Arizona, it is hard to live so far away from family. If you played Wordless Wednesday, don't forget to tell your story with Tell Me Thursday! I like playing Wordless Wednesday, but I always tell the story behind my pictures on Tell Me Thursday! Do you make to-do lists? I know I accomplish more when I write to-do lists, but sometimes the thought of writing down everything I need (or want) to accomplish is so overwhelming that I skip the list and blunder on through. I am on a list-making kick at the moment, though, and have broken my list out into different categories in the hope I wouldn't feel as overwhelmed. There are those things that have to happen no matter what in our home -- like laundry, and grocery shopping. Then there are those things that have to happen for work -- like preparing for a new class, or reviewing the books for upcoming classes. That list with the things I should do, or want to do is the list I really need to pay attention to the most. I will make sure I go to the grocery store and prepare for new classes, but I tend to let the "finish media kit", or "write query for that great article idea" linger too long on the list -- and sometimes they never get done. I realize that ignoring those types of items won't help me move forward at all, and I have mentioned many times how I'm not content with staying still. Writing this post has let me procrastinate on my current list . . . which I really need to get back to working on! Last week, we reviewed the MegaZord! Another fun toy we received from Bandai America was the Power Ranger RPM Racing Performance Cycle ! Nate (7yo) has had a wonderful time playing with this toy. The Green Power Ranger has been part of many secret missions and exciting adventures in our home during the last few weeks. Nate offered to record a video review, so here it is! We think the Power Ranger RPM Racing Performance Cycle would make a great gift! Disclosure: We received this toy from Bandai America in exchange for our honest review. No additional compensation was provided. Last week, Bo, Lydia and I had the opportunity to visit a local Whole Foods Market in Tempe, AZ and enjoyed a tour with one of their chefs, Bethany and Theresa from Marketing. I don't usually shop at Whole Foods, but I've read about them and was very interested to learn more. 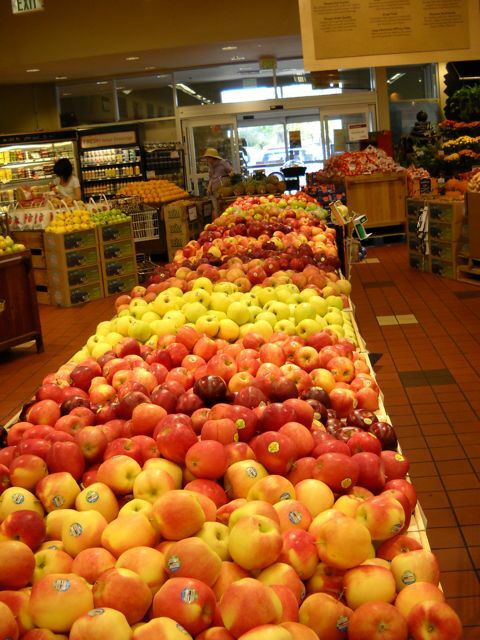 The first thing I noticed when walking in the store was how beautiful the produce section was! The fresh vegetables and fruits were displayed in a way that made the color stand out and the store was bright and welcoming. We talked about Thanksgiving and Bethany offered to make some suggestions for our meal this week. We started in the produce section and Bethany talked about her preference for organic foods. 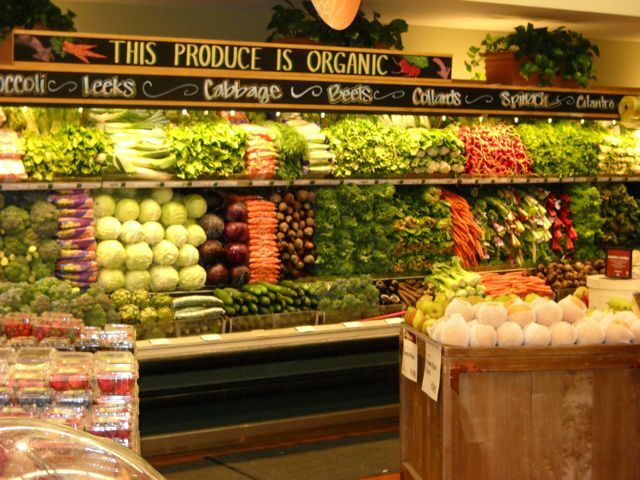 Whole Foods has a wide selection of organic produce and provides samples for many of their goods. Bo & Lydia sampled some of the organic Gala apples and both declared them delicious. Bethany asked if we have beets for Thanksgiving, and Bo & I looked at each other with a funny look. When I think of beets, I think of canned beets -- which I have never enjoyed. These were fresh beets, however, and Bethany assured us that they were delicious when roasted. They had both yellow and red beets and I purchased a few of each to roast on Thursday. The recommended serving is about 1/4 lb raw beets per person -- less if you have a bunch of sides. 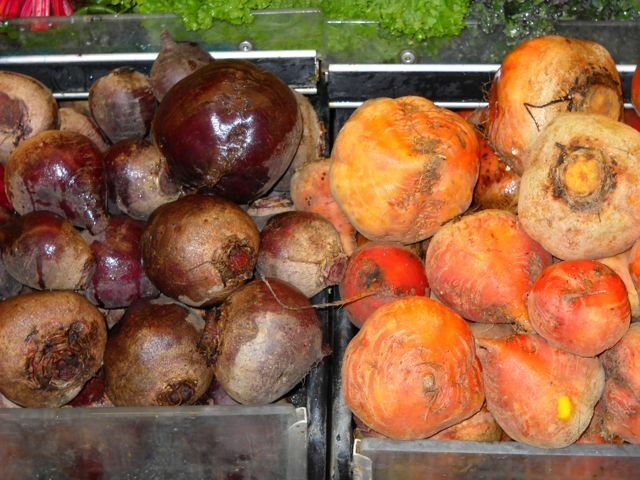 The recipe she gave us for roasted beets is very simple! Bake on cookie sheet for 45 minutes to an hour. 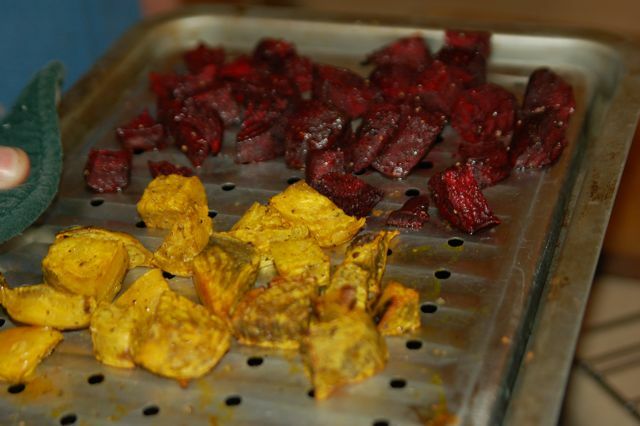 If roasting both red and yellow beets, use separate cookie sheets since the red color will bleed, but the flavor is the same. Bethany suggested a very simple green bean almondine by sauteing green beans, then topping with toasted almonds. Our next stop was potatoes. I thought that Yukon Golds were best for mashed, and Bethany agreed. I asked about adding cold milk vs. warm milk to the potatoes and she said that you always want to add hot to hot. Boil potatoes until fork tender. Bethany likes to leave the skin on, we usually peel most of the skin off, but may leave it on this year! Drain the potatoes in a colander and let them steam in the colander for about 15 minutes to remove extra moisture. Return to pan and mash. Add warm cream and butter. She suggested melting the butter and adding it to the cream to mix into the potatoes. Grate a white cheddar (about 2 cups for 10lbs of potatoes) and mix in, along with salt, pepper and a sprinkle of fresh chopped chives on top. Using a white cheddar keeps the potatoes creamy-white. When we stopped at the wine and cheese department, a very helpful associate named Dave helped us choose a sharp white cheddar (Kerry Gold Kilaree). We were able to sample it before purchasing, and it's been a struggle not to nibble on it before Thursday! 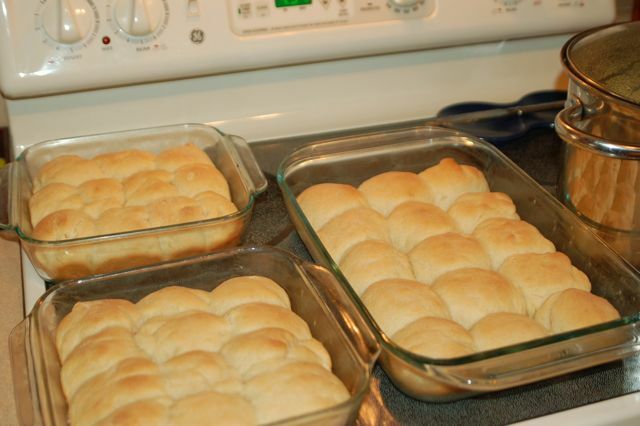 I will share how these recipes were received by the family after we enjoy them on Thanksgiving! I have another post in the works about Whole Foods and my experience there, but I wanted to throw up those food tips before Thursday! I had a great tour with Bethany and am eager to share more insights about that tour soon. Before I close, I want to mention that Whole Foods has a wonderful selection of prepared foods that could either be your Thanksgiving meal, or round it out with additional sides. We sampled the turkey, as well as some vegetables, and thought it all tasted delicious. Here's a picture of Bethany (in the middle) with her team! 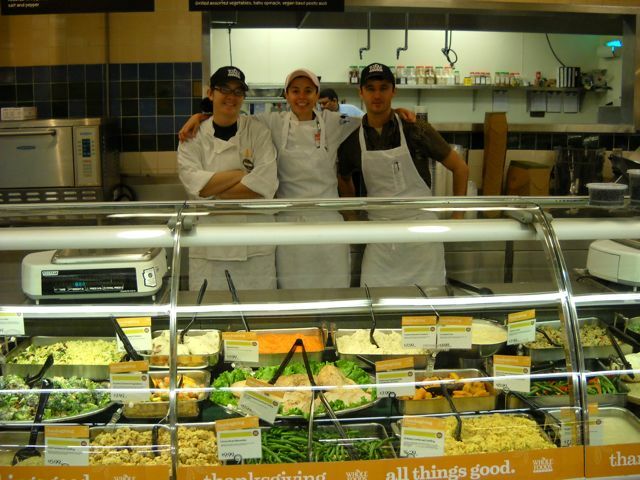 If you visit the Whole Foods in Tempe, be sure to say hello! 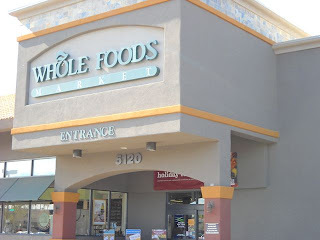 Disclosure: I received a selection of Whole Foods brand foods to help round out our Thanksgiving meal, as well as a gift card to help me purchase some of the items mentioned in this post. We have a bakery outlet near us, where we can purchase loaves of bread for around $1/loaf most days. They are the same breads in the grocery stores that cost $3 - 5/loaf, but they usually are close to their stale-date. In my house, that's okay because it doesn't last long anyway!! I like when my husband stops to pick up the bread, because I rarely make the time to shop at a store where I can only purchase one thing -- especially when I have the kids with me. I like to multi-task a bit more while shopping, but I do like the savings!! I have a new favorite gadget and if you use anything that needs charging, I think it will become your new favorite gadget as well! iGo is a company based in Scottsdale, AZ (close to me!) and I had the chance to meet some of their staff recently. They gave me an iGo Charge Anywhere charger and a few different tips to try out so I could share my thoughts with my readers. iGo chargers have multiple tips that connect to the charger, so you can use only one charger instead of an entire drawer-full of chargers when you need to charge various devices. It's much simpler to have a small pouch of tips for your gadgets and only one charger to use. The Charge Anywhere has the added advantage of holding a charge in an internal battery when it's unplugged. It can be used as a traditional charger, plugged in the wall, charging 2 different items at the same time. Then, you can unplug it and carry it with you because the charger holds a charge! You don't need to plug it in to an electrical outlet when your iPhone needs a charge after you've used it to surf the Internet all day at a conference! Just plug in the cable and you can fully charge something without plugging it into the wall! I attended an all-day conference and can't believe I forgot to bring this handy charger along because my iPhone was completely dead by the time I drove home. That was the last time I forgot to bring it, though! On my recent trip, I carried it and used it on the plane to charge my iPhone after Lydia drained it playing toddler games. Then I used it to charge both my iPhone and iPod that night and during our visit. Nate and Colin have used it to charge their Nintendos and their Zunes in the car. I've also used it to charge my Kindle . The Charge Anywhere charges Apple, BlackBerry, Creative, Garmin, HP, HTC, Jabra, Jawbone, Kodak, Kyocera, LG, Magellan, Microsoft, Mio, Motorola, Navigon, Nikon, Nintendo, Nokia, Palm, Plantronics, Rio, Samsung, Sanyo, Siemens, Sony, Sony Ericsson, TomTom devices and MORE! Tips are sold separately, but if you don't have the appropriate tip, you can always use the USB cable that came with your device to use the charger. They do sell a simple wallet to store your tips to keep them organized. iGo has a wide variety of chargers available, for laptops and mobile devices. They currently offer free shipping for orders over $25 and chargers can be ordered online, over the phone, and at some retail establishments. Visit the iGo site for more information. If you're looking for a gift for anyone who uses mobile devices, I highly recommend the Charge Anywhere! Disclosure: I received a Charge Anywhere charger, selection of tips and tip wallet from iGo to facilitate my complete and honest review. Last week, my sister, daughter & I hopped a plane to visit my parents for a couple days. My parents often head west in November, but since they weren't able to do so this year, I decided to go to them. We flew in Sunday to celebrate my mom's birthday, then headed back to Arizona on Tuesday. Pack light, but bring extra outfits. I packed one extra outfit, which we needed before we got off the plane on Sunday (she spilled ginger ale all over herself!) I should have packed 2 extra outfits, but thankfully we finished the trip without needing another extra outfit. Pack snacks. I always always always do this . . . but I didn't this time. I'm not sure why, but I left without my usual stash of snacks in my purse and figured I would buy the snack boxes. On our flight out, by the time the flight attendants reached row 12, they were out of food to purchase. US Airways doesn't even give out pretzels with their drinks, but at least we did get a drink. We were all pretty hungry by the time we reached Grandma's house, but she had plenty of food to fill us up. Bring an empty, re-usable water bottle. Security doesn't allow you to bring liquids through, so I carry a re-usable bottle. Vendors charge $2-4 for a single bottle of water, so this way I can fill up the bottle and use powdered drink packets to flavor it. Take advantage of opportunities. At some airports, travelers with small children are able to go through a shorter security line. 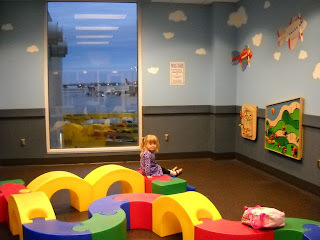 The Milwaukee airport had a children's play area, which Lydia enjoyed playing in while we waited for our flight home. Some airlines allow you to pre-board if you have small children. Pre-boarding allows you a little more room to get settled, and there's room in the overhead bins for your carry-ons to be above your seat. Bring an iPhone or iPod or other entertaining device. My iPhone is loaded with toddler games (99% of which were free) and my sister had an entire season of Animaniacs on her iPod . I brought a pair of headphones that fit Lydia and she spent a good portion of the trip playing games or watching videos. Fill a row (if possible.) The three of us filled one row, which made travel easier as Lydia sat between us and had the freedom to move a bit more than if a stranger were next to us. If you are traveling by yourself with a toddler, I suggest sitting your toddler next to a window so they can look out the window during the flight. Plan for frequent bathroom breaks. Even though the bathrooms on planes are ridiculously small, walking the aisle and having a break from the seat is worth squeezing into the small room. For a recently toilet-trained toddler, it's also absolutely necessary! I think we averaged about one trip an hour during our 4 hour flight. Enjoy yourself! I realized that traveling with one child is much simpler than traveling with 2 or 3, but no matter how many children you may travel with do your best to leave stress behind and enjoy the experience. Lydia had a great time, but isn't ready to hop on another plane just yet. On Wednesday, we headed to the airport to pick up family that is visiting, and she yelled "I don't want to get on an airplane!!!!" as we pulled up to the airport. I'm sure she'll be ready the next time an opportunity comes up!